Most people are celebrating some kind of holiday this month. We will be celebrating Christmas this weekend in our home. I feel like I am so far behind in the preparations! Normally I would have had our photo card and update letter out by now. Oh well, too much going on this year. Another holiday recipe you might find helpful comes to us directly from the Crock Pot Girls. If you haven't found these gals on Facebook yet, you will be pleasantly surprised. They are masters at Crock Pot recipes and this breakfast casserole is no exception. Lightly brown breakfast sausage (it should still be partially raw… just brown enough to be able to crumble the meat). Layer half of the hash browns in the bottom of slow cooker, followed by 1/2 of sausage and 1/2 of ham. The next layer will be all of the baby spinach, the mushrooms, and onions. Repeat the first 3 layers (hash browns/sausage/ham), and then top with a can of rotel. Whisk the 18 eggs in a bowl, then pour over top. Sprinkle cheese over top of casserole and cook on low for about 8 hours! 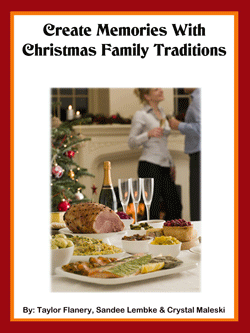 You can download your free copy here Fun Christmas Traditions. Enjoy!